In the old days when watches were viewed as nothing more than jewelry pieces to be pampered, Casio thought differently; they saw a tool that could accompany its wearer through the most demanding and grueling of ordeals, if designed right. This led to the triple 10 design concept that remains the bedrock on which every G-Shock watch has been manufactured and released till date. The triple 10 design demands, nay, guarantees that every G-Shock watch: has a 10-year battery life; endures 10 bar water resistance and can absorb a 10m free-fall drop. This triple 10 concept is the reason for the robust and rugged design that we all love so much. Over the last 36 years, G-Shock has defined and maintained what was required for a watch to be considered ‘tough’. Born of a simple dream, creating a watch that never breaks, the G-shock line of tactical watches has continued to lead the way in redefining and revolutionizing the way we look at watches. It is from this proud, storied and daring heritage that the G-Shock Rangeman Master of G Series Stylish Watch comes from. The triple sensor consists of a Compass for direction, a Barometer for pressure, and an Altimeter for your altitude. Basically, these are three metrics you want to have close by at all times if you are an outdoor person. The barometer even has a graph display that can help you predict the weather depending on if the graph is rising or falling. Around the edge of the watch, face is the solar cell that powers your watch battery with solar energy. This ensures the continued working of the watch while the wearer goes about their business. This is a very liberating feature of the G-Shock rangeman. With The G-Shock Rangeman, it’s possible to adjust the times of sunrise and sunset. This is especially useful if you are on a hike or maybe on safari or any situation where it is vitally important to know the exact hours of sunrise and sunset. The phone actually has features that allow you to program the city you are in, and using that information. The watch is capable of telling you the exact times of sunrise and sunset on a given date. This is a feature that is rare among watches, and that includes the many watches that belong to the G-Shock brand as well. 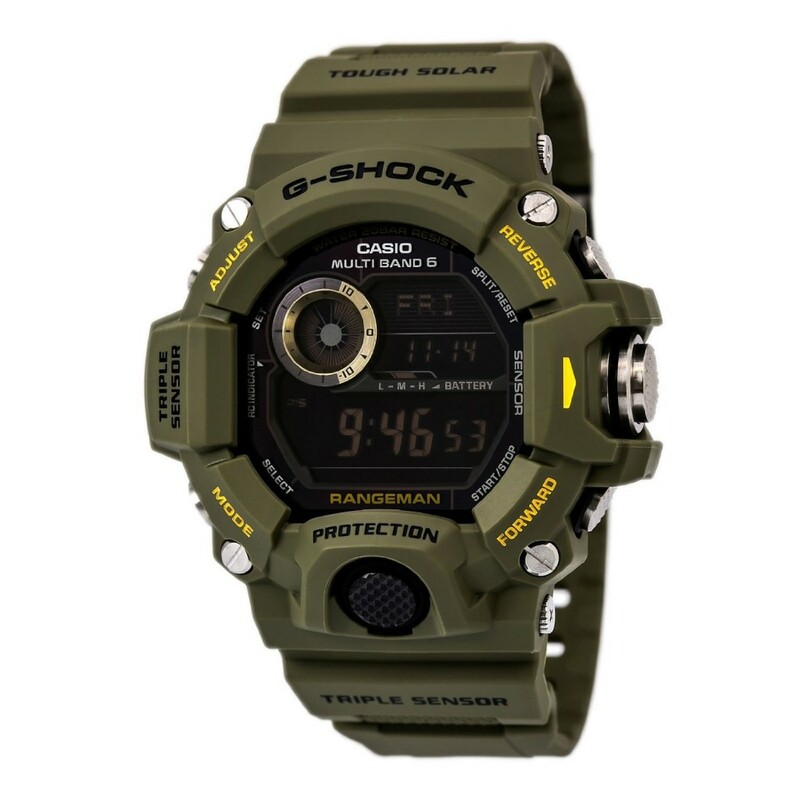 The G-Shock Rangeman also comes with 6-band atomic clock control that enables it to keep much more accurate time. This synchronization is automatic. You also have the option to switch it to manual if you want. When you do, the watch tells you the last time it got synchronized. Only one pusher (center right) for all menu features. Q: Does this watch come with the international warranty? Q: Does it come with the automatic light? A: Yes, it comes with automatic lighting when turning the wrist. You can also turn off the automatic lights if you so wish. This G-Shock Rangeman review is meant to tell you the truth about this watch. In truth, you would be hard-pressed to find a better one in terms of functionality and design. This is a watch built for people of action, obviously; but also one that allows you to ‘act smart’. You can go about your normal routine, perfectly secure in the knowledge that all the hard questions have been answered. Features like the recall feature, sunset/sunrise feature among others can help you plan ahead, while still allowing you to make the most of the present moment. By all means, a great watch.